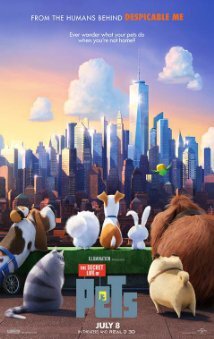 From the creators of Despicable Me, The Secret Life of Pets is a family treat worth the watch. This is the story of animals when their owners leave the home for reasons like school, or work or whatever comes to mind. So what do the pets do? This sort of reminded me of Toy Story when the toys moved and talked but the animals take that role in this flick. We follow the story of Max (voiced by Louis C.K.) who loves his owner very much but one day gets a new brother named Duke (voiced by Eric Stonestreet). Duke becomes the alpha and this has Max infuriated. Max goes to talk to his cat friend Chloe (voiced by Lake Bell) who suggests he does something to turn the alpha tables on Duke. It works but then Duke takes Max on a walk and decides to ditch him. That's when the adventure of getting back home to Katie (voiced by Ellie Kemper), their owner, begins. Along the way they meet all sorts of animals, other pets and other pets who were once pets but were thrown out or simply hate humans. One such evil ex-pet is Snowball (voiced by Kevin Hart), a little furry bunny. One neighbor pet who is in love with Max is Gidget (voiced by Jenny Slate). She, along with Chloe, Mel (Voice by Bobby Moynihan), Buddy (Voice by Hannibal Buress), and Tiberius (Albert Brooks), set out on their own adventure to rescue Max and Duke. On their way back home, Max and Dukes side of the story they get closer and closer to working together. Labels: Albert Brooks, Bobby Moynihan, Ellie Kemper, Eric StoneStreet, Hannibal Buress, Jenny Slate, Kevin Hart, Lake Bell, Louis C.K.